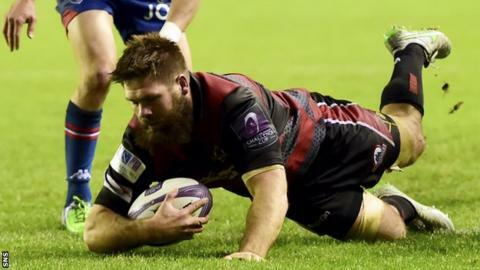 Edinburgh arrested a run of three defeats as they started their European Challenge Cup campaign with a dominant forward display against Grenoble. Last year's runners-up dismantled their opponents at the set piece, yielding a double for Cornell du Preez and a penalty try. Both teams' backlines stuttered, scarcely threatening out wide in inclement weather. But Grenoble grabbed a bizarre consolation through Daniel Kilioni. The meteorological havoc wreaked by Storm Abigail - swirling gusts and a near-unrelenting downpour - ensured there was never likely to be a match rich in thrilling abandon at Murrayfield. Indeed, it must have felt like playing rugby in a cavernous washing machine for the players. Even allowing for the weather, Edinburgh were disappointingly sloppy when more than two passes in a phase were required, but that seldom mattered when their much-vaunted pack emerged so formidably from the maelstrom. The tone was set in the opening six minutes, with penalties gained from a highly-profitable scrum and maul in quick succession, Du Preez splashing over from a lineout drive that splintered Grenoble's eight. Sam Hidalgo-Clyne pushed the conversion attempt from wide on the right and visiting fly-half Gilles Bosch should have put Kilioni in to level just five minutes later. After an arcing run - aided perhaps by obstructing support runners - took him to within five metres of the Edinburgh line, Bosch's pass to the winger drifted forwards, resulting in Kilioni swinging his boot at the advertising boards in anguish. Spearheaded by Scotland trio Al Dickinson, Ross Ford and Willem Nel, the scrummage continued to prove a potent source of possession and penalties for Alan Solomons' side. Grenoble withdrew their flagging tighthead prop Kevin Goze only 24 minutes in, Walter Desmaison his replacement. The French outfit enjoyed some success through the combination of box-kicking scrum-half James Hart and rampaging wing Martino Nemani giving chase. But they would lose flanker Fabien Alexandre to a yellow card after he impeded Hidalgo-Clyne - the scrum-half slotting two penalties from two monstrous scrum shunts, one taken against the head, to give Edinburgh an 11-0 half-time lead. Grenoble's penalty count hit double figures shortly after the break - more than half of them conceded at the scrum - and Hidalgo-Clyne soon stretched the hosts' lead by three more points. Captain Hart got Bernard Jackman's side off the mark from the tee following a strong period of possession culminating in Hidalgo-Clyne rescuing a probing grubber in his own in-goal area. Edinburgh then wasted a brilliant opportunity for a second try. Greig Tonks fed the onrushing Dougie Fife, who strode some 50 metres downfield, but with Will Helu poised to canter under the posts, the full-back's inside pass was wayward and fumbled. Grenoble struggled with their lineout - on several occasions the ball was thrown meekly to a slightly bemused Edinburgh jumper and from one such malfunction, they mounted another forward effort. That yielded a series of scrums, and ultimately, inevitably, the penalty try - converted by Hidalgo-Clyne - that put the game beyond doubt. As Grenoble's infringements grew, Nemani was red-carded for verbally abusing the referee. But the visitors did cross with a bizarre try of their own in the final 10 minutes as Scott spilled attacking possession in Grenoble's 22. The centre tried to lash the ball into touch in frustration, but it ricocheted into the arms of Kilioni, who raced all the way home untouched, Hart converting. Du Preez rounded things off for Edinburgh in the closing stages, plunging over from another maul and Tonks added the extras. Edinburgh: Fife, Hoyland, Helu, Scott, Brown, Tonks, Hidalgo-Clyne, Dickinson, Ford, Nel, Bresler, A. Toolis, Coman, J. Hardie, Du Preez. Replacements: Kennedy for Hidalgo-Clyne (66), Sutherland for Dickinson (61), Cochrane for Ford (61), Andress for Nel (66), Manu for Coman (50), Watson for J. Hardie (61). Not Used: Kinghorn, Dean. Grenoble: Gelin, Nemani, Farrell, Willison, Kilioni, Bosch, Hart, Barcella, Jammes, Goze, Percival, Marie, Diaby, Alexandre, Hayes. Replacements: Mignot for Willison (50), Taumalolo for Barcella (50), Heguy for Jammes (61), Desmaison for Goze (23), Hand for Percival (50). Not Used: Setephano, Loustalot, Dupont. Sin Bin: Alexandre (30), Nemani (64).